It’s day three and I am still hungry for miles. Everything works perfect. No pain, whatsoever. They serve the heated-up croissants for breakfast, at least it is the same company that delivers food to Google in Zurich. The lady asks me if everything was OK in my room. I answer “oui, pas de problèmes”, although this isn’t true. The first shower I couldn’t turn to warm water, so I had to go to another one – for 78 bucks you can’t expect a shower in your room at la Vue des Alpes. There was a table tennis table in the shower room and a huge pie tray parked in front of my door. The room was ginormous, but it served as a stash room for older Ikea furniture. The TV didn’t work but they had two issues of a watch magazine. 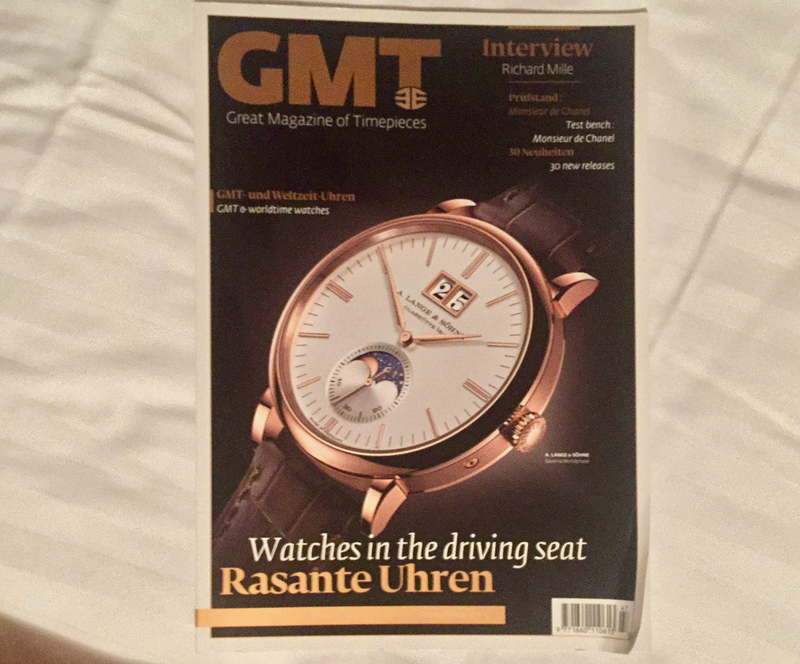 With a watch from A. Lange on the cover, that’s a German brand, if you try to sell watches in this kind of rooms you may need to readjust the brands (maybe something cheaper, like entry level from Swatch Group). Personally, I do prefer Garmin anyways. And they have the orange juice rationed on the tables. I am happy to leave on time for the sun rise. I hate my pack by now. For doing day trips it is maybe not even bad. Try to hike 12 hours + a day for three days on a row. It is like a collection of design mistakes. It has pockets on the straps, but they have zippers. You can’t open and close them with one hand. And you have to close them otherwise you may lose your stuff. The material is trashy, the main compartment zipper is not strong enough. Salomon makes great running vests but their extension into a kind of action oriented hiking packs went wrong. At the moment they don’t have a direct successor in the 30 liter category. There is a model called QST 30. It’s just an ordinary pack, nearly 3 pounds heavy. And they have the S-Lab Peak 20 – 20 liters is just too small. I also got more impatient with the concept of soft bottles. For running, they are great, especially if you have supporters who have all the time in the world to refill them or aid stations. If you do a marathon and you are willing to extend them with an additional bladder on the back, it is fine. They store away quickly but if you hike the entire day, bottles who stand upright by themselves are much more versatile and you can do things like putting tablets or powder in it much faster. The worst thing on the Peak 30 is the way the seams are fabricated. They are hard. If you put some tension on the hip belt because you maybe want to relieve pressure from the shoulder straps the seams are pressed into your hip bone. You could avoid this problem by extending your natural padding but in this case, you don’t need a lightweight backpack anymore anyways. Pa’lante packs apparently has a vest style pack in the making. With a prototype of this pack the AT FKT was improved this year. I will write to them, although I have no big hopes. John Zahorian himself did an FKT on the Colorado trail and they offered the pack he was using for maybe 2 days on their website. After that it was thought about of bringing the pack back to production. It never materialized. Maybe they have another prototype they can send me? What I like on the Pa’lante packs is that they are not compromised, not made to please as many potential customers as possible. They are purpose made by people who use them by themselves for long distance hiking. They have a clear focus. And no clutter. Pa’lante packs are born out of the necessity to have a lightweight pack but at the same time not to carry potentially faulty design. You can’t open the Peak 30 like a normal backpack. Once you open the zipper for about 10 cm it will open itself and everything falls off. 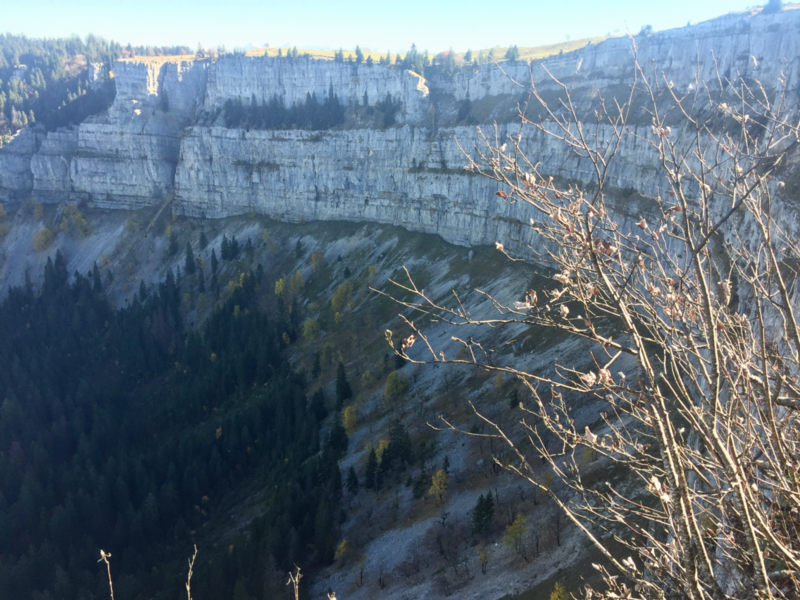 However, today is kind of tough as I have to go to the Creux du Van. It is a touristy spot. First, I have to get there as it is some hours of walking from the Vue des Alpes. Soon I am on a nice alpine plateau. It is a military shooting range and the signalization indicates 5 hours till Noiraige, the last town before the ascend to the Creux. I see some trail runners and I play with them as I am in a steep climb. I can hike faster than most people can run in this terrain. One wears the same shoes as I do. As we arrive at the peak I try to remember my CPR skills as he is nearly dying. I am not even out of my breath. It is not an easy way to the Creux. It has no water and I have to follow a ridgeline for hours. There is really no water. I drink a hydro-gel as my mouth gets dry. Suddenly, I spot a group of men sitting around a camping table. This can only mean that civilization is near as they don’t leave the impression to be ready to carry their furniture exceptionally far. Then there are people with climbing helmets. But something doesn’t match in their appearance. They don’t look like they are rock climbers. There is a via Ferrata. I don’t like it. If you want to go to the mountains, do it as little intrusive as possible. It’s like the rope park on the Balmberg. Folks come up there with the car. Noiraigue is a nice little town, just under massive rock faces. I come by a cow patch and the cows let me borrow water. In the town itself everything is closed. So, I take water from a fountain in front of the school. There is a fat sign “No drinking water” but I use my filter. Walking 16 miles with just one liter of water and a hydrogel, a coffee without milk and one Powerbar energy wafer may not be for everyone. I tackle the ascent nevertheless. Bunkers for my protection are always visible and then come the tourists. Seriously it is like Niagara Falls. There is a small and rocky path, most people look extremely worried as the path is slippery as well. I overtake everyone. Walking with trail runners is so much easier than with these heavy leather boots. Place your forefoot and you are good to go. Damping, balancing, stabilization does your ankle. I am humble, I don’t try to push my way through the tourists and I never ask someone to go aside. But I am happy if everybody makes it safe to their destination. There is a car park in the vicinity and there are thousands of people. There are Ibex, but they seem to have a day off on Sunday. And there are wild boars. Their tracks can be seen all over the place. It is windy, and I am happy when I’m alone in the forest again. There are road walks. I try to walk on the shoulder and I hold my poles on the side which is away from the cars. I change the hand and the direction of the tips after I am nearly overrun by a fat Audi. The next one doing this will have to schedule an appointment with his coach builder. To remove the scratches. My feet start to hurt as a car stops right in front of me. This is the kind of situation where accidents with guns happen. Thankfully we are in Switzerland, nobody is armed. My hand goes to my pepper spray nevertheless. “Excusé nous, on est perdu, on veut aller au Creux du Van, est-ce que vous savez la direction ?” “Je pense que c’est cette direction, il y a beaucoup the gens qui venez de la.” I could have had a look on my app, but I was not in the mod. I prefer to watch the landscape and its beauty instead. I set a new goal: Saint-Croix. On my map it seems to be a small town. It will have public transport. I will have to climb the Chasseron to get there. The last two hours of daylight I spend alone. Nobody around. I wish it was night, so I could further investigate these eyes. I reach the Chasseron without problems. The sun is setting just in the very moment I reach the peak. I change the eyewear and look up the train connections. There are plenty. Down to Saint-Croix takes two hours according to the way sign. Perfect. When running down, I usually need one third of the indicated time. I love trail running in the dark after 30 miles of walking. I reach Saint-Croix without problems. They even have a Kebab store, it is called Istanbul City. Locals smoke. The train ticket is expensive and in Zurich I can’t remember where the tram halts that will bring me to my new address. I am happy with the way my body performed. I did not drink one beer and I never stopped at a store or a restaurant, except in the places I had to. Oh, and about the eyes. Normally I switch my big headlamp just to its lowest level, as it is enough light to see everything. Out of pure boredom I turn it up this time as I am going down the mountain. I know, I don’t have to spare power. I even think about seeing things I don’t want to see, like ski lifts and so on that would steal the illusion of still being in pure nature. Animal eyes have different colors even in the night. Usually, you see only the eyes reflecting in the night. Some are like yellow, others like white. You can estimate which kind of animal it could be by the distance between the eyes and the distance to the ground. Many eye pairs together at a low distance from the ground could be Boars. Two eye pairs together higher up could be road-deer and so on. Only when you are close enough, with some luck the animal can be identified by its silhouette. There are not dozens of species roaming our forests. The mysterious eyes were back when I turned the headlamp to max power. Like the days before the animal did not move and the eye color, the distance above ground and the distance between the eyes was the same as in the days before. This time however, the creature decided to run away over the dirt road into a small open space in the forest. I could observe it for some seconds. It had like small brushes on top of the ears and a short tail. It was much bigger than a fox.